I read a recent article that reports that drinking directly from water bottles can cause just as many upper lip wrinkles as smoking. I wouldn't doubt it as any activity that makes your lips pucker, which activates the orbicularis oris muscle which encircles the mouth, can cause wrinkles to appear on the upper lip. The development of such wrinkles is a function of both the activity and how often it is done. Drinking water these days for some people is about as frequent as a regular smoker who does one or two packs per day. 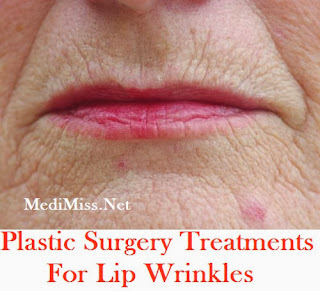 Treatment of lip wrinkles is a challenging problem. I tell patients to think of it as improvement as there is no complete cure in most cases. For small and fine lines that are mainly located at the junction of the skin and the lip, an injectable filler can make a nice improvement...provided you find it acceptable to have a larger lip size. (whichever you desire) When the lip wrinkles are deeper and run higher into the upper lip, the concept of skin resurfacing comes into play. This typically means lase resurfacing and the question is how deep to go with how long of a recovery that will be acceptable to the patient. When the lip lines and wrinkles are more severe, I usually use a combination of making the lip bigger with injectable fillers and resurfacing the skin with a laser. This is usually done under local anesthesia in the office unless the patient is having other major facial surgery, such as a facelift, where the procedure would be then performed in the operating room. There is some current debate between the laser techniques of resurfacing or peeling and the use of fractional (fraxel) laser treatments, but there is no hard clinical evidence at this point to say conclusively that fractional laser treatments are better. In the more severe cases, a small amount of Botox to help reduce the amount of muscle movement can also be helpful when done with fillers or laser resurfacing but you must be careful to not use to much lest you make your smile have an unnatural appearance. Alternative treatments for lip wrinkles through skin modification are currently being evaluated. One method is to combine laser resurfacing with the use of sandpaper (yes I said sandpaper), known as laserbrasion. With laserbrasion, a combination of upper skin removal is done first with the laser and the deeper skin areas are taken down with sandpaper. The concept here is that the use of sandpaper causes less trauma (no heat) and will heal faster without the prolonged redness. And it is just as effective as the laser but safer and with less complications than if one used traditional dermabrasion. The other method is known as percutaneous collagen induction therapy. (PCIT) Like aerating your lawn, making very tiny holes throughout the upper lip with a small wheel lined with microscopic needles cuts into the deepest portions of the skin. As this heals it causes the skin to thicken which helps reduce the amount of visible wrinkling. Upper lip wrinkles in some women are unavoidable and can be very troubling. Injectable lip fillers, laser resurfacing, and Botox can help but there is no permanent cure. The alternative treatments of fractional laser treatments, laserbrasion, and collagen induction therapy are interesting but it is too early to know if they will offer better results.